The Pressbox owner and publisher, Gene McLean, makes his Derby Day picks. The Stakes races begin with race 6, at around 1:13 p.m. on Kentucky Derby day. And, since this is NOT Gulfstream Park, where post times are merely a suggestion that the race may be run some time that day. So, the Stakes races will begin around 1:13 p.m., or close thereto. Roca Rojo (6) gets a “double dot” here. This mare is some kind of nice in another top notch field. Rojo won two in a row last fall before losing to Miss Temple City by a skinny nose in the Grade 1 Matriarch at Del Mar last December. Has been off since, but she fires right out of the gate for trainer Chad Brown. This closer loves, loves, loves a yielding turf and will get there. Miss Temple City (2) is a rock star, having won over $1.4 million. Three straight stakes races with Beyer’s over 100. But she doesn’t really like a soft turf, based on her past. Class alone makes her tough. Mississippi Delta (5) is another who likes a soft grass course and likes this distance, with five top 2 finishes in 8 starts. I am playing a horse I have watched since his first race. Excitations (9), who is owned by the Fairgrounds Racing Club, was highly touted for his initial start and ran his eye balls out. He lost a head bob at the wire to a horse named Girvin. Know anything about him? Excitations ran off with an allowance win at Keeneland on April 12. He is ready for the next step and is 10-1 ML. Don’t miss out. Local Hero (1) has been running against the Triple Crown heavyweights all spring, and proved he didn’t won’t a true two-turn race. Turning back today and he could be salty. Be he lost to Girvin worse than Excitations. Uncontested (4) is pure speed, who doesn’t like two turns either. Gets Mike Smith today. Huge jock change. Beware. Sonic Mule (11) loves 7 furlongs to a mile – max. Pletcher. Tough race, with lots of horses with chances. I go with Oscar Performance on top (4), due to the fact that he had a start this year – running an uneven race in the G3 Transylvania. Slow start. Rushed up. Flattened out. He will benefit from that today. I really want to put Good Samaritan (10) on top. I bet my eyes out on him in the Breeders’ Cup last fall. He had a horrible trip, 5-wide in the stretch and still nearly got the top two, while finishing third. He hasn’t raced since then, and may be just a tad short because of it. But I love him. I bet Big Score (2) in Lexington at 10-1 odds and had a nice payday. Could win right back. The dot goes to Made You Look (9), but gets back on turf after a try in the Fountain of Youth (due to Derby Fever). His odds are likely to float up and this dude can run on grass. Another wide open affair, but I am landing – and landing hard – on Masochistic (2). 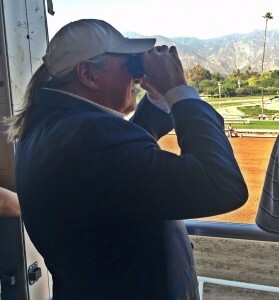 Has Mike Smith up, again, after a tough beat in the Triple Bend at Santa Anita. He floated a little wide in the stretch that day and it opened up the rail for Denman’s Call – who is white hot right now. Box those two, but I love the 2 here. I have talked to Buff Bradley, the trainer of Divisidero (2) all week. Buff’s dad, Fred, was a long-time friend of mine in both horses and politics. Son, Buff, can train. His horse is sitting on a giant effort today at a course he loves (2-for-2). If you get 4-1 odds, hammer time. Others go over and under. McCracken (15). Love him. Sitting on a huge race. So many reasons why, but just know he is The Man in this race today. Ian Wilkes – a former assistant to Carl Nafzger — is a class act and I hope he gets his “Carl and Mrs. Ginter moment” today. How do you not like Gunnevera (10)? He had no shot in the Florida Derby and still ran third on a speed favoring track. The ones that finished in front of him that day will not finish in front of him this day. Tapwrit (16) had an off day on a speed-favoring track in Lexington. He ran a huge second to McCracken in Tampa. The same finish may happen today. Huge odds. J Boys Echo (13) ran huge in New York and was compromised in Lexington, too. The Blue Grass could be a key race for several today. Throw in Thunder Snow (2) – that race in Dubai was one kind of gutty run. Love horses like that. Have some fun with this one today. One heck of a betting race. In closing, we are alive with six horses today in the Oaks – Derby Double. Hope you, as well, jumped on our PICK yesterday. But if McCracken can get home first today, I may take tomorrow off. Due to a headache that I see coming.